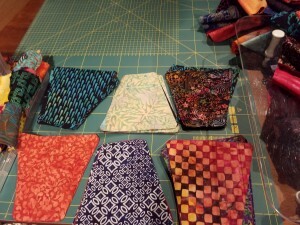 There are a lot of times in patchwork when we want a random distribution of our fabrics throughout the quilt. It is something a lot of my students say they find very hard. This is how I do it when I have a lot of pieces. I have precut a lot of these pieces to make a one block quilt. They are all odd bits of batik I had no plan at all to how many of each or even what colours. I split my big stack of pieces into 9 piles, yup I know there are 6 in the picture. These are my 6 main draw piles. I am working on 9 rows at once, each was started by picking 2 fabrics from the 6 top ones. Once the 9 pairs were made I added a third to the first pair I stitched. the only rule I have is I can only take a top piece, no searching through the stacks. Usually that works fine, but evey so often the stacks may get similar and be the same as both ends of th next row I need to add to. If that happens I use the 3 emergency stacks. So far I have 9 rows each with 15 pieces and I think they are all pretty random. It isn’t perfect randomisation. This way does mean I never get the same fabric next to itself. It’s close enough to random to lool the part. For those who are really challenged by random the best solution I have found is to put all the pieces into a container you can’t see into and pick blindly. Then you may set the rule that if it is the same as the one you need to stitch to you put it to one side and draw again. Just don’t forget to put the set aside one back in the container as soon as you draw one that is different. Good luck with random, it can look amazing.